Q.1 Which of the following correctly describes the magnetic field near a long straight wire? Sol. (d) The field consists of concentric circles centred on the wire. Sol. (c) Producing induced current in a coil due to relative motion between a magnet and the coil. Sol. 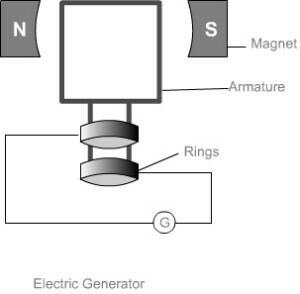 (d) AC generator has slip rings while the DC generator has a commutator. Q.6 State whether the following statements are true or false. Q.7 List three methods of producing magnetic fields. Q.8 How does a solenoid behave like a magnet? 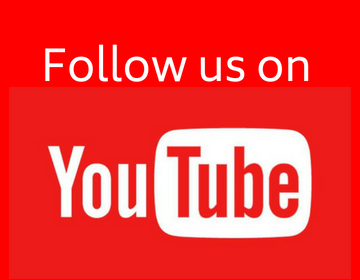 Can you determine the north and south poles of a current–carrying solenoid with the help of a bar magnet? Explain. Sol. 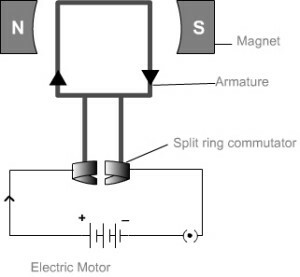 A solenoid begins behaving like a magnet when electric current flows through it. We know that any current carrying conductor creates a magnetic field around it and that is what happens in case of solenoid. For determining the different poles of a solenoid, we can use a bar magnet and look for interaction between different poles of two magnets. If the north pole of the bar magnet gets repulsed by a particular pole of the electromagnet (solenoid) then it gets confirmed that the bar magnet was brought near the north pole of the electromagnet. Q.9 When is the force experienced by a current–carrying conductor placed in a magnetic field largest? Sol. From Fleming’s Left Hand Rule, it is clear that when the direction of current and magnetic field are in mutually perpendicular directions, the deflection in conductor is the maximum. This shows that when magnetic field and direction of current are perpendicular to each other, the force experienced by the conductor is the largest. Q.10 Imagine that you are sitting in a chamber with your back to one wall. An electron beam, moving horizontally from back wall towards the front wall, is deflected by a strong magnetic field to your right side. What is the direction of magnetic field? Sol. Here, the electron beam is moving towards the viewer, i.e. out of the plane of the page. This means that the direction of current is towards the page. This shows the direction in which the forefinger is pointing. The thumb is pointing towards right which is same as the direction of deflection. The middle finger is pointing downwards; which shows the direction of the magnetic field. Q.11 Draw a labelled diagram of an electric motor. Explain its principle and working. What is the function of a split ring in an electric motor? Electrical energy is converted into mechanical energy by using an electric motor. Electric motor works on the basis of rule suggested by Marie Ampere and Fleming’s Left Hand Rule. In an electric motor, a rectangular coil is suspended between the two poles of a magnetic field. The electric supply to the coil is connected with a commutator. Commutator is a device which reverses the direction of flow of electric current through a circuit. When electric current is supplied to the coil of electric motor, it gets deflected because of magnetic field. As it reaches the half way, the split ring which acts as commutator reverses the direction of flow of electric current. Reversal of direction of current reverses the direction of forces acting on the coil. The change in direction of force pushes the coil; and it moves another half turn. Thus, the coil completes one rotation around the axle. Continuation of this process keeps the motor in rotation. In commercial motor, electromagnet; instead of permanent magnet; and armature is used. Armature is a soft iron core with large number of conducting wire turns over it. Large number of turns of conducting wire enhances the magnetic field produced by armature. Q.12 Name some devices in which electric motors are used. Sol. Electric fan, mixer grinder, tape recorder, CD player, hard disk drive, washing machine, cooler, toy car, vacuum cleaner, etc. are some devices in which electric motor is used. Q.13 A coil of insulated copper wire is connected to a galvanometer. What will happen if a bar magnet is (i) pushed into the coil, (ii) withdrawn from inside the coil, (iii) held stationary inside the coil? Sol. When the bar magnet is pushed into the coil or withdrawn from the coil; the galvanometer needle would show deflection. When the bar magnet is kept stationary inside the coil; the galvanometer needle would show no deflection. Q.14 Two circular coils A and B are placed close to each other. If the current in the coil A is changed, will some current be induced in the coil B? Give reason. Sol. When two circular coils A and B are placed close to each other and the current in coil A is changed, it leads to induction of current in coil B. This happens because of change in magnetic field of coil A; because of change in current in this coil. Q.15 State the rule to determine the direction of a (i) magnetic field produced around a straight conductor-carrying current, (ii) force experienced by a current-carrying straight conductor placed in a magnetic field which is perpendicular to it, and (iii) current induced in a coil due to its rotation in a magnetic field. Q.16 Explain the underlying principle and working of an electric generator by drawing a labelled diagram. What is the function of brushes? The structure of electric generator is similar to that of an electric motor. In case of an electric generator a rectangular armature is placed within the magnetic field of a permanent magnet. The armature is attached to wire and is positioned in way that it can move around an axle. When the armature moves within the magnetic field an electric current is induced.The direction of induced current changes, when the armature crosses the halfway mark of its rotation. Thus, the direction of current changes once in every rotation. Due to this, the electric generator usually produces alternate current, i.e. AC.To convert an AC generator into a DC generator, a split ring commutator is used. This helps in producing direct current. Q.17 When does an electric short circuit occur? Sol. When positive and negative wires touch each other, the resistance suddenly decreases and current increases. This leads to excessive heating of wire which manifests in the form of sparks. This is called short circuit. Q.18 What is the function of an earth wire? Why is it necessary to earth metallic appliances? Sol. The earth wire transfers any leakage of electric current to the earth. The leaked current can otherwise reach the metallic body of an appliance and can lead to electric shock. Earth wire prevents from electric shock by safety transferring the leaked current to the earth.